The free Midsummer Arts festival returns for its 5th annual event in Monteith Riverpark on Saturday, August 5, from 10 a.m. to 7 p.m. Midsummer Arts offers guests multiple hands-on opportunities to interact with theater, dance, music, and visual arts. The festival includes a large arts and crafts area, free demonstrations and workshops from local arts organizations, and a craft vendor area filled with handmade creations by local artisans. Participants in the festival include Legacy Ballet, South Albany Theater Arts, Linn-Benton Community College, Improv at the Majestic, Gallery Calapooia, and more. In addition to dance and theater, the event will include puppets, magicians, painters, a stiltwalker, and others. The grand finale of the festival will be a performance of “Romeo Monteith and Juliet Hackleman,” a semi-improvised play blending Shakespeare’s classic “Romeo and Juliet” with Albany history from the 19th century. During the course of the play, patrons who participated in one of the day’s activities (for example, learned a dance routine from Legacy Ballet) will have an opportunity to share that new skill within the play. The play promises to be a very community-driven event, filled with a cast of hundreds. Midsummer Arts is an all-volunteer 501(c)3 nonprofit arts organization, committed to engaging the communities of the mid=Willamette Valley through greater access to local arts and cultural diversity, and exposure to historic downtown Albany. For more information, contact Michael Winder, Board President, 541-979-9840 or midsummerarts@gmail.com. Note: This event and it's organizers are not affiliated with Albany Helping Hands. This Public Service Announcement, web content and press releaseis provided as a community service. 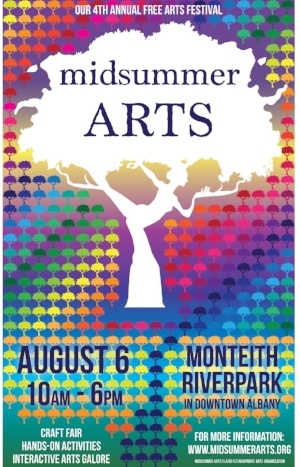 Midsummer Arts returns to Albany Oregon's Monteith Riverpark on Saturday, August 6th, 2016 from 10 am to 6 pm for its fourth annual free festival of local arts and culture. Come enjoy lots of hands-on activities, free workshops and demonstrations, and short performances from local thespians, painters, puppeteers, musicians, and more! Children can get a stamp in the Albany Visitors Association summer passport, and bring home a free craft activity. There will be tons and tons of fun! Free dance classes. Disc golf. Pulled pork sandwiches. Visit the covered picnic area (the “gazebo”) for several free arts & crafts activities for kids and families, maybe see a puppet show or get up close and personal with a few acrobats. Event attractions include: free arts activities presented by Gallery Calapooia, the Arts Center, Improv at the Majestic, South Albany HS Theater Arts, and Legacy Ballet. There will be storytellers, ventriloquists, poets, painters, crafters, actors, singers, dancers, and more throughout the event offering free workshops and performances. The weather is predicted to be perfect and the fun begins at 10 o'clock, Saturday August 6th, 2016.